I am a retired educator from the Department of Education here on Maui. I am a self taught woodturner from Maui. I have been turning since the early 1980's. Since my beginning, I have been turning basically end grain Norfolk Island and Cook Pine bowls. I have used these two woods mainly because of its availability here on the island. I also use other woods such as Milo, Pheasant Wood, Mango, Tamarind, Kamani, Koa though these woods are harder to come by so I return to my two favorite woods, Norfolk and Cook Pine. 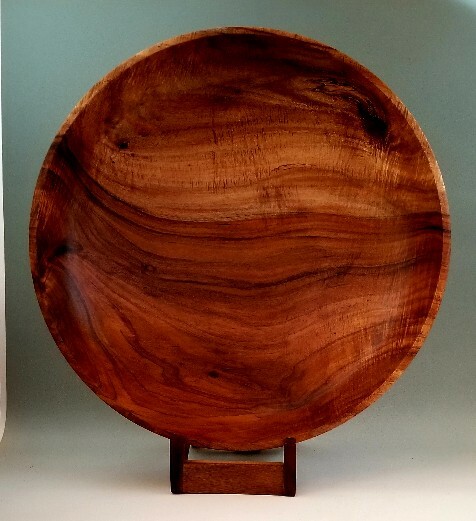 I have been fortunate to have my bowl work accepted in the Hawaii Craftsman Hawaii exhibit in the late '80's through the '90's. My work has been accepted in Maui's juried art exhibit show, Art Maui for many years along with having my work purchased by the Hawaii State Foundation on Culture and the Arts. I am currently the treasurer for the Maui Woodturners Association that is a chapter of the American Woodturners Association (AAW). I enjoy the interaction and sharing of ideas and teaching techniques with others who have the interest in woodturning. Being retired allows me to spend more time to my love of woodturning. Prior to retirement, shop time was limited to a few hours at night and time during the weekends and holidays. There were no summer time vacation time for me as I was a twelve month employee with the Department working in the District Office. So, I now have the time to pursue my passion towards woodturning. My work is displayed in galleries here on Maui. Three in the Lahaina area and two in the central area. As a kid I have always enjoyed working with my hands and making things. Now as an adult, I still enjoy making things though I have fewer cuts on my fingers as compared to my kid days. This is about all. Aloha.